Today’s horrific fire in London's Grenfell Tower is a symbol of a deeply unequal United Kingdom. Every time a tragedy occurs, you can rely on a wave of commentators chiding any attempt to “politicize” the situation. With today’s Grenfell Tower fire in West London, those voices were prominent immediately. And no wonder: the atrocity was explicitly political. In the richest borough of one of the wealthiest countries in the world, people in social housing, many on low incomes, were killed and injured in a fire that could have been prevented or contained. Rather than diverting blame from those responsible, or treating it as an act of nature, our responsibility is to ask why it occurred. Time and again, residents reported serious concerns about the safety of the building to the management organization, the local council, and the member of parliament (recently unseated in the general election). They were met with silence, and several told me on the scene they were convinced it was because they were poor, living in a rich borough that was determined to socially cleanse the area as part of a gentrifying project. Today’s fire in Grenfell Tower is not outside of politics — it is a symbol of the United Kingdom’s deep inequality. The block of 120 apartments housed between 400 and 600 people, some in very crowded conditions. Tenants reported problems with elevators, emergency lighting, wiring, and boilers. Even the most minor improvement required constant badgering. People were given the message that they were lucky to have any home at all, let alone in a borough that harbored such wealth. It is a truly terrifying thought but the Grenfell Action Group firmly believe that only a catastrophic event will expose the ineptitude and incompetence of our landlord, the KCTMO, and bring an end to the dangerous living conditions and neglect of health and safety legislation that they inflict upon their tenants and leaseholders . . . their sordid collusion with the RBKC Council is a recipe for a future major disaster. 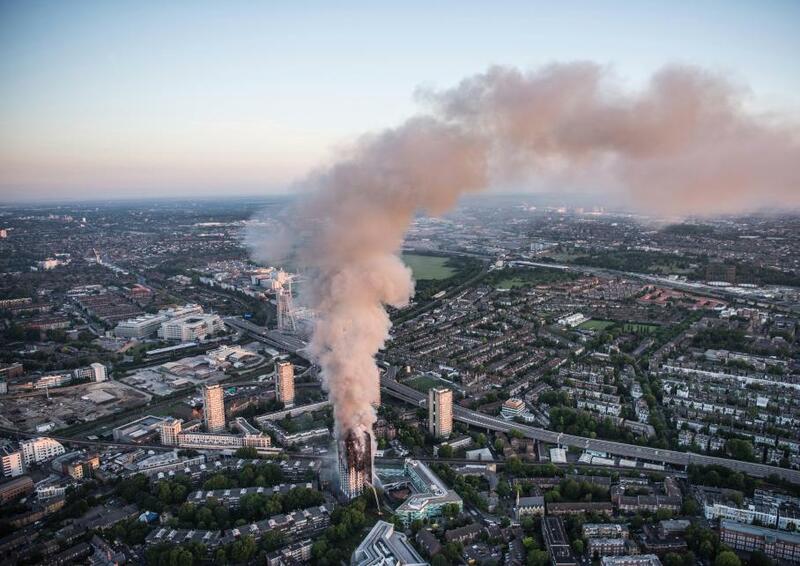 The result of the disaster they predicted is evident: a blackened skeleton on the skyline in West London. The fire is still burning, but every home in the block is destroyed. Those who survived have lost everything. Many people are still missing, and the death toll continues to rise. The surrounding streets are full of people fighting back tears, aided by scores of volunteers handing out water. Housing has become the barometer of inequality in the UK: home ownership levels are falling and rents are rising. Meanwhile, the Conservative Party has mounted an attack on social housing, ramping up private sales of council homes. Theresa May’s new chief of staff, Gavin Barwell, was one of a series of housing ministers who sat on a report warning that high-rise blocks of flats such as Grenfell Tower were at risk of fire. He failed to carry out the review that had been requested. The Conservative Party makes no bones about which side it represents in Britain’s housing divide. When Labour proposed an amendment to the government’s Housing and Planning Bill last year that would have required private landlords to make dwellings “fit for human habitation,” seventy-two Tory members of parliament who were landlords voted against. Last week’s general election showed a widening divide in Britain, between those who can afford housing and those struggling to keep a roof over their head. The Conservatives promised little on housing in their manifesto, expecting a core vote of homeowners to turn out. Instead, huge numbers turned out to vote for a Labour Party that promised to build houses and tackle sky-high rents. The only way to stop tragedies like Grenfell Tower from happening again is to accept that adequate housing is a right, not a privilege. People on low incomes deserve governments and local authorities that value their lives. Our homes should protect us, not put our families at risk. Margaret Thatcher famously argued that there was no such thing as society. It was an idea that did immense damage, particularly to those who need social housing. But, in places like West London, on days like today, it is proven wrong in a fundamental way. The local community pulled together, offering places to stay, taking donations, coordinating resources. The volume of rage at the tragedy, and the fact it seems so preventable, has forced politicians to promise investigations. The battle now is to ensure that this anger is turned into change. Survivors must be properly housed. Those who could have prevented the fire must be held accountable. People living in similarly dangerous conditions across the country must be given urgent assistance. The housing crisis must be tackled. As one resident told me, many people will have died locked in their homes, aware that nobody had cared for their safety while they lived. The only way to change a world where that can happen is through political action.